At Jarco Roofing & Solar, we specialize in flat roof installation, replacement, repair, restoration, and maintenance. We have decades of experience working with flat roof systems and have worked with a wide range of residential and commercial clients. We've worked on flat roof projects of all sizes for homeowners, schools, businesses, industrial centers, and more. Our clients prefer us over other Southern California roofing contractors because we provide excellent workmanship at very competitive prices. In addition to providing unbeatable value, we stay on schedule, clean up after the job is done, and deliver superior customer service. All of our flat roofs are built in compliance with local codes, California's Title 24 "cool roof" requirements, and NRCA's (National Roofing Contractors Association) standards. As part of our services, we will pull any necessary permits, arrange for city inspections of the foundation, and submit details plans for new construction. For those looking to extend the life of their flat roof, we offer a wide range of flat roof repair and maintenance services that range from cleaning to sealing to correcting seams and flashing. 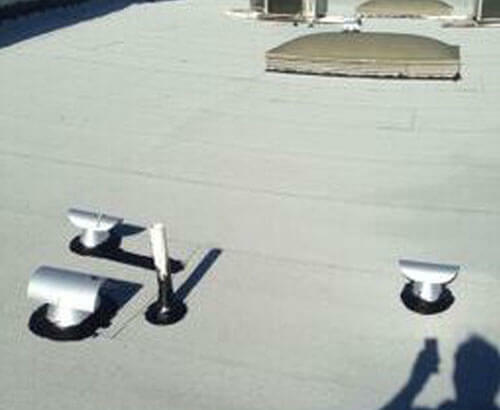 If you have an older commercial roof, we also offer roof reconditioning. Roof reconditioning involves applying a polyester emulsion directly on top of your existing roof. Because roof reconditioning doesn't require property owners to tear off their roof, can extend the life of their old roof by another 10 to 20 years, and can even extend the roof system's warranty, we are able to save our typical client thousands of dollars. Exceptional Workmanship. Quality Materials. Lasting Results. To learn more, call Jarco Roofing & Solar today. We offer free on-site estimates to all of our clients across the Canyon Lake, Menifee, and Temecula area. and our office is open from 7 a.m. to 4 p.m., Monday through Friday. Our business is licensed, bonded, and insured. We accept cash, check, and credit card for payment. We also offer senior discounts.